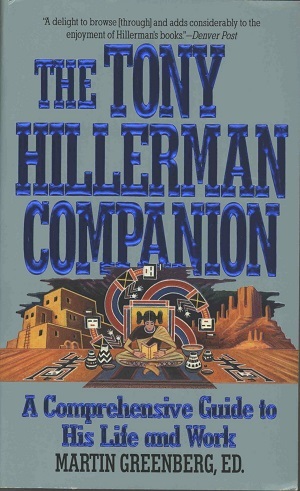 This is the paperback edition of The Tony Hillerman Companion: A Comprehensive Guide to His Life and Work, edited by Martin Greenberg and published by HarperCollins Pulbishers in New York City, NY. This guide includes a detailed synopsis of each novel, concise sketches of every character, an extensive, never-before-published interview with Hillerman, and a timeline of the most important events in his life. It also contains a selection of Tony Hillerman's fiction and nonfiction work. Binding: Paper covers with full color illustration. The editor, title and publisher are printed on the spine along with a portion of the front cover illustration.